Himes Bhaiyya, Since Chennai main moviee ka ticket hi nahin avlabel hai, so main na, watched it on pirated DVD. So plis excuse. Many peepuls are telling ki you are arrogant and don’t know how to act or sing. So Himes bhaiyya, I want to prove your critics wrong. I want my blog readers to look at this collage and think from their heart. You criticizing peepuls, look at Himes’ us-kokya-kehte-hain?haan “gamut” of emosuns. And Himes, your songs totallyt rawk. Peepuls say you sing thru your nose, but they nose nothing. Heh Heh. See Himes, pun. I normally don’t believe in rituals but when you held the gitaar and sang Gayathri Mantra na, I was like, totally feeling spiritual, patha hai? I will take my gitaar and say the Gayathri Mantra averyday from now. See peepul, Himes is having such a pojitive affect on me.So for all these dumb criticizing peepuls like Greatbong, I made this one page cartoon comic of the Moviee. Criticizing peepuls need such simplicity to understand the real luv of Himes. For those short-sighted criticising peepuls, here is the full size verzun that will bring the full affect of Himes hawtness to your puny brains. Previous Previous post: When I speak, simply vibrating no? 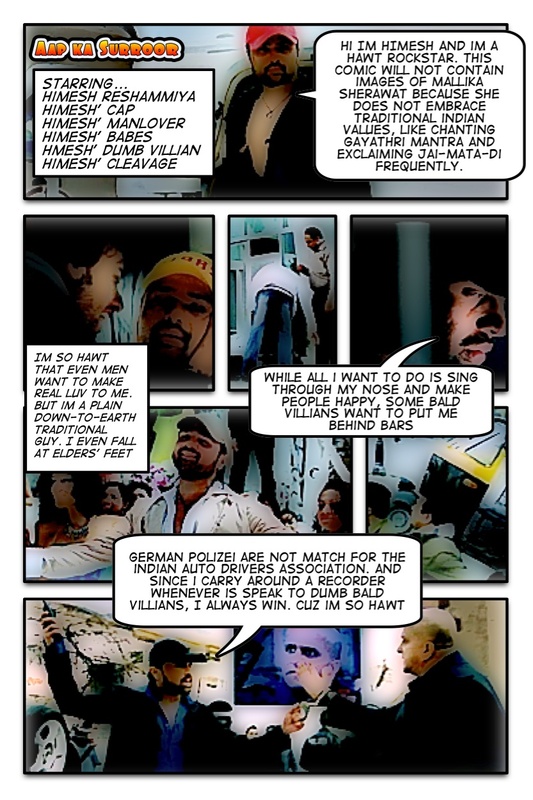 Hey Krish, that comic strip is a superb work maaan! :-)) Too good! super..I meant your review, not the movie 🙂 I especially loved the puns and accents! Very hilarious… Are bhaiyya, Himes rawks in these cartoons. you have an awesome blog, mate! is there a version of comic life for windows? or some equivalent substituent? No. Sweet, useful, creative software is only made for the mac platform. I love that you included a picture of boy toy. He was such an important part of the story [i have to admit i enjoyed this movie a little more than i would’ve liked. Also do yourself a favour and watch this movie called Sandwich starring Govinda. I guess it was made over the course of a decade or something so parts of the movie feature fat Govinda and other parts feature not so fat Govinda. There’s this one dialogue that makes the entire experience worth it. I have a Mac, though I have never heard of this Comic Life thingy. Maybe it is only available in the neo-Mac? However its not free..well there is always pirate bay. Don’t believe all that you hear. Himes removing cap only for 4 nanoseconds at a funeral and even then full head not visible. Only partial side view of face. The area above Himes forehead is a sacred spot and cannot be revealed to the world till Armegeddon comes. Brilliant post. Someone really needed to clearly and intelligently show the world the greatness of Himesh, and you have done it. I especially loved the “gamut of emotions”. Anybody who claims to have looked upon it without a tear in their eye is a liar. Hey…thank you dude. Looking at your blog, i was trying to do such a portrait(same as yours) using photoshop. But it was never possible. Now came to know about a new software. himesh , i hate those people who write bad things about you . but we still love you sooooooooo much. take care . Ha ha , i hate the guy’s gutts to do this on a regular. I dont know wether you were cussing him or praising, wateva it was, it sure made me happy! Good way to show your class.Nothing to say to shits like you.